In the dizzying hours following JFK’s assassination, while most were understandably overcome with emotion, the man right in the center of it all who suddenly found himself ascended to the Presidency, was by many accounts extremely calm. As Robert Caro describes in “The Transition”, his gripping New Yorker article this week, LBJ’s life instantly transformed from a going-nowhere-fast Vice Presidency that was likely about to be embroiled in a kick-back scandal, to the most powerful man on the planet. 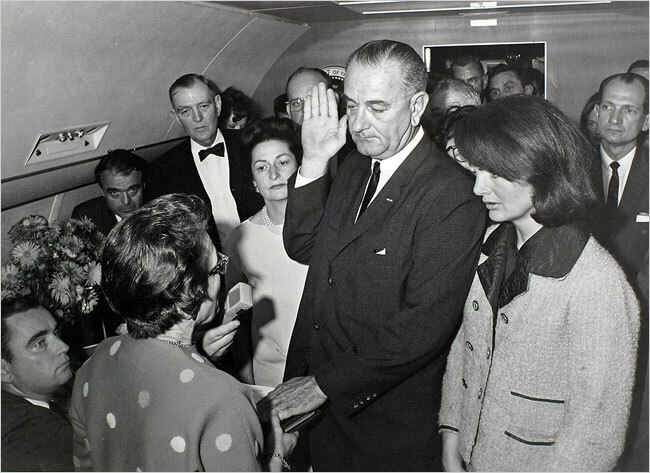 Yet in those few hours on November 22, 1963 — when he was whisked away from the shots being fired, to the hospital where JFK was pronounced dead, to Air Force One to be sworn in — he’s described generally as calm, cool, and collected. If being calm is good in emergencies, why doesn’t it come easily to us? Said another way, why is LBJ’s poise unusual and noteworthy even 50 years later? Gonzales argues that stress, which releases hormones that interfere with the part of the brain that allows us to perceive our broader environment and make decisions, “causes most people to focus narrowly on the thing that they consider most important.” Could be fight. Could be flight. Could be anything. The problem is, we live in a modern world where it’s not just all about getting to safety — every day we face an infinite set of “hazards” that evolution couldn’t possibly have forseen to prepare us for. One of those key adaptations is the ability to control one’s fear, enabling the brain to maintain its ability to perceive and make informed decisions.